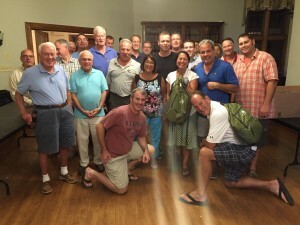 On Wednesday, Aug. 26 at the Moorestown Community House, the Moorestown Breakfast Rotary Club held a service project where 160 backpacks were filled with school supplies, from folders to pencils, for Moorestown students in need in various grades. Moorestown Board of Education members attended to assist with the project, including President Kathy Goldenberg and Board Member Brandon Pugh. This service project has been taking place over a decade through a partnership with Moorestown Breakfast Rotary (coordinating and donating supplies), Moorestown Township Public Schools, and Moorestown Ecumenical Neighborhood Development (MEND). Over $7,000 worth of supplies was donated, and every member of the Moorestown Breakfast Rotary contributed. “This is a great event for the students, and will make their first day at school wonderful. The program has been in place for over a decade putting smiles on children’s first day of school to help them succeed,” said Breakfast Rotary President Scott Aschoff. “I am truly appreciative of the Breakfast Rotary’s generosity in coordinating this project every year because I know it means a lot to the Moorestown students who receive the backpacks, and it was a pleasure to volunteer,” said BOE member Brandon Pugh.